We all went there, so it should be represented. Picture left taken by me in 1965, picture right by Steve Murray. 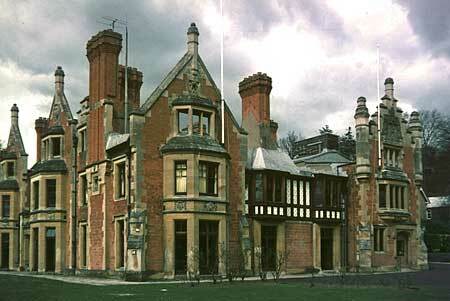 The building was sold by the BBC in 2001 and became a country house hotel and restaurant. In December 2005 it closed and the staff were made redundant. Gareth Maynard, who has sent us a photo of A85's Reunion in 2006, says that Wood Norton is now open once more, though it was rather quiet when he was there! For a nostalgic view of the Wood Norton estate, taken in the winter of 1981/82 by Andrew Lillywhite, click on the ETD in 1981/2 button, and more recently Dave Devlin has sent us some slides he took in the Spring of 1969. Also see ETD in WW2 (menu above) to read about wartime at Wood Norton. To see what enticed us to join up in the first place, click on Careers 1963 to see the BBC's "Technical Careers in the Engineering Division" booklet, thanks to Mike Jordan, Careers 1972 to see the BBC's "Careers for Technical Assistants", and Careers 1975 to see "Engineers in the BBC", thanks to Peter Done. Howard Dell has supplied a brochure from BBC Resources extolling the facilities available at Wood Norton Hall - see Brochure. One cannot forget the BBC Club in Evesham itself, and Eddie Wheaton has sent me a photo of it taken recently by his son on his mobile phone, along with a line drawing from 1964. Following on from the picture of DE Intro 20, Mike Skipper has suggested a list of past Lecturers to add to the recollections. Over to you out there - email me. In April 2008 I received a DVD of Course Photos and assorted pictures from Wood Norton thanks to Andy Woodhouse and John Paroussi. This section has now expanded greatly to accomodate them all - and we've still got room for more! A recent addition is a movie (via John Paroussi) shot in the 1970s (I think). At the moment I have posted a section shot in D Block and the BBC Club - you can access it from the BBC Club (newly renamed) menu item above. And new for 2010 is an aerial picture of ETD in the 1940s (or 1950s) - still they come, Gordon Williams who sent the aerial photo has also sent a canteen menu for May 1963......! Latest addition is an aerial photo from the late 70s or early 80s thanks to Ian Jones, who has just (January 2011) sent me a couple of ETD Christmas Cards. As well as the Guide, Bob sent some photographs from April 1966 which will also stir some memories - they certainly did for me - see ETD in 1966. John Shepherd has also scanned some photographs from his PTA Course in 1960 - see ETD in 1960 and PTA 8 in TA Courses. 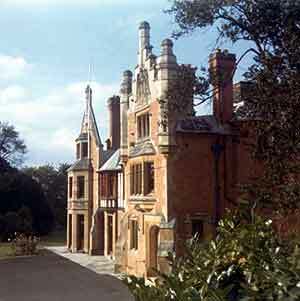 Robin Hall has recently discovered a flickr gallery documenting the fate of Bredon Wing.